« The Vikings End Up Keeping A Fullback… On Their Practice Squad. The Vikings have sign 7 players to their practice squad according to Mike Wobschall of Vikings.com. Vikings can carry up to 8 players on the practice squad, and My guess is the Vikings would like to get TE Allen Reisner on there if he clears through waivers. I really like the practice squad, all the guys who I thought were on the line and could make the 53 or just miss it. What’s up with Ross Homan? I thought he was going to be a player. How was his camp and pre-season? Did he sign somewhere else or just not cut the mustard? Wow, I really like this practice squad. If we can get Reisner through waivers and onto the PS, this will be awesome. I can’t believe DeGeare made it. I understand signing one fullback to the practice squad but two, not sure about that move when there glaring weakness is clearly in their secondary. I like that they resign Caleb King, he really knows how to be patient and set up his blocks for a rookie and has great vision. Chris DeGeare got a message sent to him loud and clear, get your but in gear or you could even be released from the practice squad after showing so much promise last year filling in for Hutch when he got hurt. I can only assume that he was not in football shape and his play suffered as a result he almost was without a job at all, if that doesn’t serve as a wake up call I don’t what will! I hope the Allen Reisner clear waiver wire with the way the Vikings intend on utilizing the TE’s there is bound to be an injury during the course of the season. I heard Ross Homan had a concussion and those things can linger for weeks and even months which would notify his ability to contribute to the team in any way shape or form this season. That’s to bad cause I like the kid, it may serve him well to let the marble stop rattling around in his head and work out for a year before attempting to try a come back with the Vikings or another team considering his age and promise I sure we see him again in the NFL. Vikings signed SLB Chad Greenway to a multi-year contract extension. Greenway was previously under contract through 2011 on a $10.091 million franchise tender. Though he’s yet to make a Pro Bowl, the 28-year-old is one of the stoutest and best all-around 4-3 linebackers in football. Pro Football Focus graded Greenway as the fifth best player in the league at the position last season. Also an IDP stud, he’s averaging 116 tackles a year over the past four seasons. 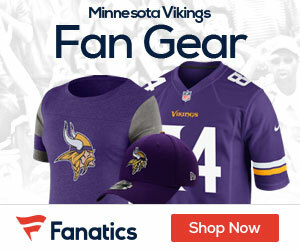 The Vikings confirmed their high opinion of Greenway by franchising him over both Sidney Rice and Ray Edwards during the winter. They didn’t give the money particulars in the story on Rotoworld. I would have to imagine like most contracts it will be back loaded and some of the money this year was turned into a signing bonus which would help with the salary cap. Also they said that Camarillo took a big pay cut to stay with the team. This also helps with the salary cap. I love the direction the front office and Frazier are taking this team. Shedding some old dead weight and building for the future while forcing players to play for their job. Reisner has cleared waivers and is now the 8th man on the PS according to 1500. Whew, I was a little worried for a bit there. Not sure why the Vikings are high on this kid Stephen Burton or Matt Asiata when there are clearly other positions of pressing needs to address, they must have been very impressive in practice because we didn’t witness anything in the preseason games that would warrant even a practice squad spots for these two players. That being said I’m not a talent evaluation person so I just have to trust in the coaches decisions. What I do know is that they need a safety on this team not named Tyrell Johnson and that he should have been included in the final cuts, just my opinion he should have nailed down the starting role by now given that he was a second round pick, I believe that he is not dedicated enough to play such an important position and role on this defense. time to cut ties with this under achieving player.